Recently when I visit my home town Benthota I happen to step into a craft shop on the way to my home thinking to buy a wooden model of an elephant. Before stepping into the shop it was appeared to me as a shop having a huge collection of animal models but I felt I am wrong after entering into the shop. The collection was larger than I imagined, it had almost all the craft items you can possibly buy in Sri Lanka. 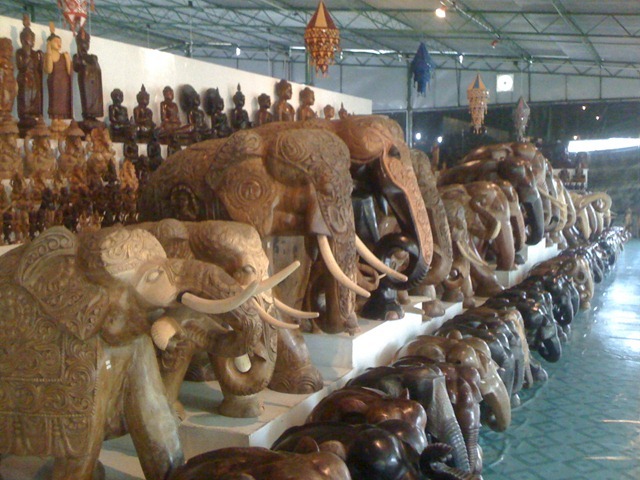 To name some it had many different god statues, animal models, traditional masks, resting chairs, wall hangers, leather items, hand bags, shoes, African masks, etc… Since the list may go on for some time I thought to put some pictures I took of the place to give you an idea. If you are a tourist visiting Sri Lanka or if you are a Sri Lankan searching for handi/crafts I recommend you to visit this shop. You can find this shop besides the road when you are travelling from Benthota to Yathramulla. If you need any help finding the place or buying these stuff let me know, I might be able to help you.